During Mr. Lee’s business trip to Maryland this week, he stopped by a comic book shop called Alliance Comics in Federal Hill. I forwarded him my list of wanted issues. He found #29 in the back issues! Bedrock Comics and The Million Year Picnic = Batgirl success! 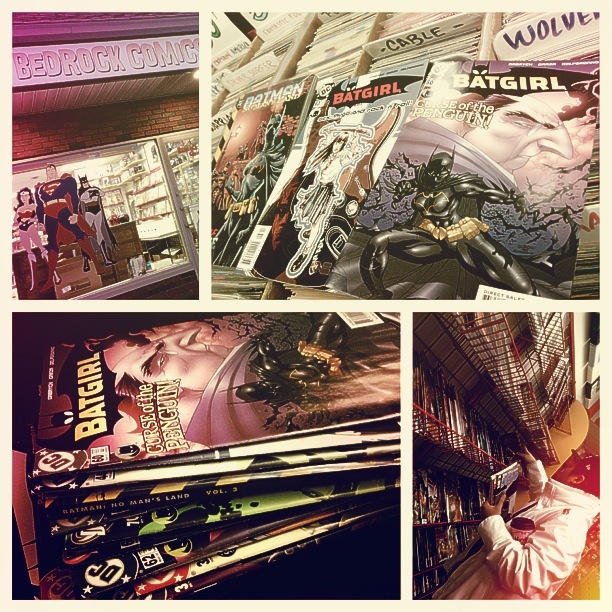 Mr. Lee and I first checked out Bedrock Comics out in Framingham. We’d driven by it before many times, but never stopped to visit. Why hadn’t we before?! The owner (I think he was anyway), Jim was super nice and helpful — he found the only two back issues hidden amongst the Catwoman section! 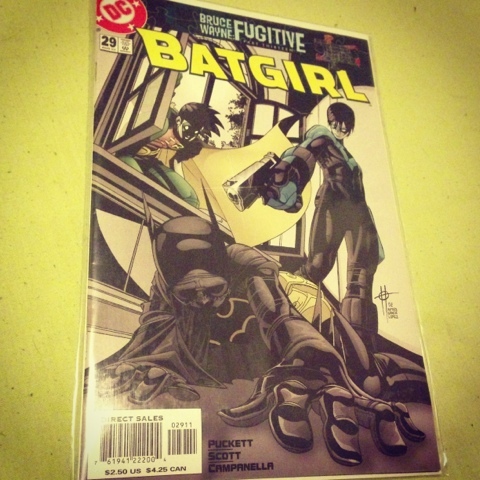 Other than not being able to find Batgirl issues — for some reason there was no Batgirl section. Maybe someone bought them all out? If so, do I have an adversary in my quest? — everything else was crazy well organized. Issues were grouped together with a note if any were missing. AND, back issues were only $0.50! This will definitely be a stop anytime I’m in Framingham for sure. Ok. So usually, when Mr. Lee and I hit up comic book shops there are sometimes signs saying ‘no beverages.’ We walk in anyway with our cups of coffee and usually don’t get hassled. But this time, immediately upon entering the shop, Mr. Lee was told to leave his coffee at the register. It’s our tried and true stomping grounds and it proved to be most successful. First off, the staff was super nice AND I found dozens of back issues — score! It was a substantial pile to carry and when I got to the register, I asked if I could possibly get a price break. It was a great suggestion by Mr. Lee because I received 10% off! Currently, I have a lot of reading to do, but I’m also compiling a list of what I now have so that I can cross check in the future to avoid doubling up on issues. This weekend was quite the haul and there are many more shops to visit (i.e., JP Comics & Games is a must on my list considering it’s in my neighborhood).